The challenge for them, just as it is for us, it that in order to Believe we have to have a solid and sure footing in which to base the Belief – which begins with Him Alone – with Jesus Christ Himself. Anyone will have a challenge with believing anything if there is no element of trust, surety or basis in which they can place that “faith” (if you will) to begin a relationship of trust. As Christians, we have a Cornerstone in the Risen Saviour, the Saviour of the World, the very Son of the Living God – Jesus Christ. We must have Christ centered as our Cornerstone if we are going to even begin to understand what is possible through Him. Each of the steps build upon one another, just like for the foundation of a home or a highway system. If the foundation is not solid and stable, the remaining items will make little difference in the grand scheme of things because the trusting aspect will not be strong enough to keep an individual from breaking away, further damaging the link to the critical relationship needed. These four steps are simple to see, but can be more difficult to put into play at some times more than others. This Series explores these four sets of steps with Bible verses of Scripture to Encourage each of us a Christians that He is there from the VERY Beginning, all the way to the VERY End. Given the opportunity, all of us could easily identify a building project in our lives – sometimes they are demolitions, other times remodels and even the occasional brand new development – but there should always be something happening in our Christian walk. Sometimes the foundation gets shuddered a bit – like an implosion – which can cause quite the commotion not only in our lives, but also in the lives of those close and dear to us. During those uncertain times, we must take a look at the foundation where we find ourselves – re-evaluate Who is the Cornerstone and what we have placed at each of those levels. This Series gives us clearly from God’s Holy Word an incredibly rich set of verses for each which should cause us to rejoice in Who He Is and What He has Promised to us. Has something shaken your belief? Is there something that has happened where you may have taken a second look, where you are wondering whether or not He’s seeing what you are seeing? With every situation, no matter the difficulty or place where you find yourself – you can place it in one of the four steps shown in this Series to find out where you are in the path of it – it is pure Bible. Find those verse on the Series page, read them – they are not my words, but God’s Word. 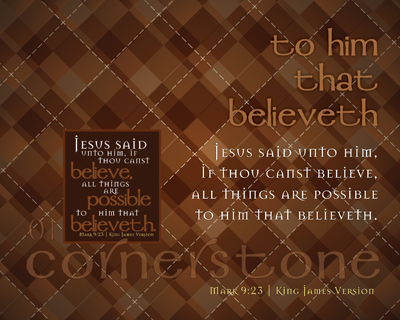 Let us each and every one Believe All Things Are Possible… To Him That Believeth! Each day provides to be an adventure in life, especially when a priority is placed on what makes the adventure work for the individual. Seems pretty simple, or is it? The title of this Series, Pleading for Restoration, should peak the interest of a broad range of thought, but there is one in particular that is being solicited – our Relationship with our Heavenly Father, our daily walk with the Lovely Lord and Saviour Jesus Christ and our listening to the Holy Spirit, which resides in EVERY Christian. My daily study and creativity, with a whole lot of strung together prayer, allows for me to have several pokers in the fire so to speak – which permeates EVERY thing that is done. 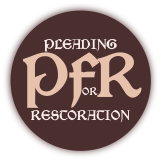 The adventure affects my outlook, where my sight is placed, what is allowed to be heard, the very speech used to speak to others, who will be spent time around, how situations are handled and most importantly why things are done the way they are – we should be seeking to be fully Restored. Let us search and try our ways, and turn again to the LORD. Let us lift up our heart with our hands unto God in the heavens. We have transgressed and have rebelled: thou hast not pardoned. The verses may seem out of order for the presentation fact of the Series, but is to be noted – the Series is in order. The theme verse is the “second” set of Scripture presented, such that we would consider why we need to Turn Again. The answering side of this Series gives us ten (10) assurances that we can indeed be Restored from our transgressions and reminds us of just Who He is to one of His Children! This Series is designed specifically for the Born Again Believer, living in a world of condemnation, who doesn’t want to live that way! The Pleadings list contains all of the parts to a process that each Christian can claim Victory over daily and presents the life change that can be made when each of us realize it has been put before of us in such a manner that would please Him for us to follow. It is my sincere hope that each of us as Christians will take the moment to recount our commitment and dedication to the study of God’s Word, in consideration of this Series. By no means is this one exhaustive to any degree, but from just a “prick” to read Lamentations again, researching the background of the writing of the book and asking myself what is it Lord that you are trying to get me to see, this is the result. What results are being shown in your life, in my life and those that we have influence over, through, within, because we are faithful to saturate our lives with God’s Word? You DO NOT have to roll through 2,400+ verses of Scripture with a fine tooth comb as has been done with this Series to learn what God has in store for us each day. Part of what you are seeing here in this Series is how God’s Work affects me personally and those with whom I’ve some level or area of influence because of Him and the study of His Word. 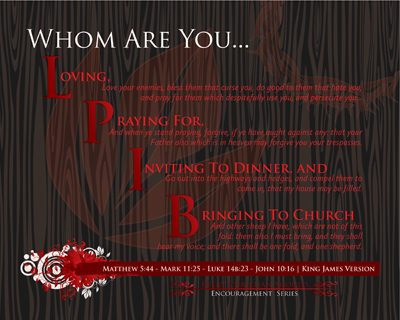 What passage will people see lived out through you and me today? How about tomorrow? What about what they hear us say? 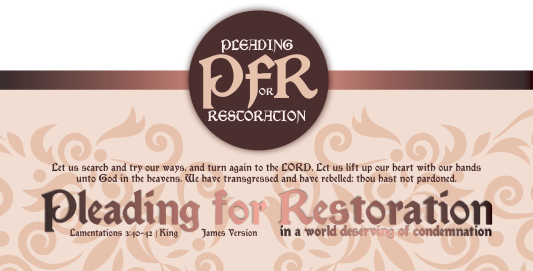 God the Father promises to Restore us and gives us SO many promises to show us that He will. Might I just want to issue this WARNING up front, this Series WILL pull you in – that is if you are awake – and loosen up your ball cap, if it is tight – or rather STIR you by way of the Holy Spirit. Whichever order or combination, it is my prayerful hope that it will sink DEEP and PULL hard, for when you see what is being presented here from God’s Word – it’ll CHANGE you, that is… if you will LET the Holy Spirit do so. NOW that the WARNING has been issued, it is my heartfelt desire that each person, who by whatever means happens across this will be challenged to see what is surely a MOST pointed lesson. We’ve heard from SO many angles about Missions from every possible person, but maybe from the Individual WHO gave us every instance from which we “see” them in actual action, with real people. The Crown of Thorns which Jesus Christ knew He would endure was the driver for His every action, interaction and example. This Series is nothing even remotely similar to what it was thought in my mind that it would be or what it might become, which was not necessarily a preconceived notion on my part. As with many Missions Conferences, Leadership Conferences, Ministry Emphasis programs and Soul Winning programs, those initial preconceptions can be shattered pretty quickly and effectively. In part, it becomes more real to us through the the actual “Missionary” who is presenting their work, what preparation they have made and the continued effort in which they strive to continue doing so, for their serving opportunity. We as individuals get to “see” them, what the result of their Ministry actually is, and we get one REALLY big additional bonus: THE ACTUAL STORY. If you will, each of us, put aside what we have always been told about Missions, the references made about how to do so, what the Disciples/Apostles did to propagate the Gospel… < Focus on that last Word, Gospel, it IS the Word of God. Something that became completely astonishing to me… Have we somewhere in the “translation” forgotten that we HAD the GOSPEL right here WITH us?!?!?! It is recorded for us, in HIS own WORDS, as to WHAT we are to be doing and He is the best Teacher, in ALL of Heaven and Creation. As Christians, we must realize (in a correct reverence), that as we seek to do those VERY things, we are going to have to BE CHRIST-LIKE in all areas of our lives. Jesus spoke of those EXACT things, being actually carried out by Him directly or placed in a real situation for us to not only ponder, but to consider, even to our own action presently. These steps can go either way – us walking down them, to put ourselves in a place of being a Servant to others as the Lord would have us, or walking up with someone, being the Servant lifting others up to our Heavenly Father. Nothing short of an AMAZING perspective that would not have been seen, as the scene, if it had not been for me being willing to put all of my notions aside, allowing the Holy Spirit to show me why the Crown of Thorns should mean something to us, from the one who Bore them for us. There are sixteen (16) statements which were carved out of the original challenge on Missions for everyday Christians to consider. The normal Scripture associated with Missions is taken from various places in the Bible, rightfully so, but this Series has a pivotal change in it, because of the Person who is examined for the example in making these considerations real in each of our daily lives. This Series started out to be something totally different than what is being presented here as the final project, which for one thing has made a delay in getting it published. The concept for the original approach, which this Series is developed as a basis, and goal were striking opposed to me personally – making it even more difficult to grasp. Finally, after revisiting it several times over, just threw my hands up, walking away from it to work on another Series project and work on a few graphics ideas. Then is dawned on me, the exact same challenge that was being had myself, was the one being committed by the original writer – it is all in the approach. 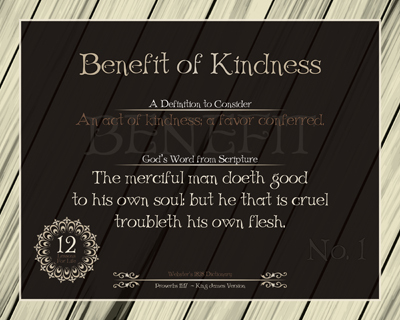 good manners “worldly concept” > make application in the Bible or attribute to a famous author by way of quote. Doesn’t seem all that harmful does it? We normally would see that in teaching a young mind or even an immature mind a concept, we would take that concept, explain it, then go to the Bible to show it to them. Harmless, right? If we take the approach of “let’s see what God’s Word says about that…” it would be deemed appropriate, but what was actually found was finding that the author went from translation to translation and outside of the bounds of God’s Word to “find” whatever would fit the definition of what they were making application of for the lesson. The pick and choose method is a dangerous, slippery slope that can present seemingly small items into very large miscommunications from God’s Word. Admittedly, I am not the average person, ANYONE that knows me would probably have a story or two to tell anyone who’d listen about that… but, here is one thing that I do know – when one goes to twist the Word of God to make a point, it is no longer about God, but rather the person doing the twisting. God does not have to twist, He merely points. This incredible list of twelve (12) Life Lessons take the approach of seeing what God’s Word says, then making application of it in, on, and through our lives – instead of taking a worldly approach and trying to fit God’s Word into the mold of it’s ways, practices and understanding. Once the direction challenge was discovered, a reversal on approach was made and the realization that these are all things that God the Father has ALREADY spoken of in His Word, the task becomes MUCH more simple to share with others. Am afraid though, Christians are so blinded by trying to make application of character trait they want to see in others, that we often forget Who’s Instruction Guide and Rule Book we should be referencing. It does take work, searching and dedication to find the Mind of God on things – but He gave us the Good Book, we need to develop the Good Sense to USE it! Being in His Word every day will change your and my day with every thing we do. Go there first, then teach the lesson, you’ll have the Holy Spirit to help you make the application and God’s FULL AUTHORITY to back it up.